A surge of new MS treatments have been for the relapsing-remitting form of the disease. A new drug that targets CD20-positive B cells may change that. Therapy for multiple sclerosis (MS) has been on a roll. Since 2009, a steady stream of more effective medications has been introduced for the autoimmune disease that attacks the myelin sheaths of nerve cells. The FDA approved the latest agent, daclizumab (Zinbryta) in May. The medication, marketed by Biogen and AbbVie, has many of the same characteristics as other recent therapies for MS. Daclizumab is a monoclonal antibody requiring less frequent dosing (monthly). It targets a unique set of immunological cells that cause the disease. And like other recently approved therapies, it’s superior to traditional “disease-modifying agents” in achieving the current MS treatment goal of “no evidence of disease activity,” or NEDA for short. But here’s the thing: While daclizumab and its ilk can greatly improve the quality of life for MS patients, all of these new drugs are approved for only one form of the disease. MS comes in several varieties. Most new patients are diagnosed with relapsing-remitting multiple sclerosis, which is characterized by flare-ups of inflammation that produce brain lesions and vision, bladder, and muscle coordination problems. A relatively small minority of between 10% and 15% of newly diagnosed MS patients are diagnosed with a different form of the disease called primary progressive multiple sclerosis. It’s a silent thief of vitality that produces slow and steady neurodegeneration affecting motor skills and cognition, absent the acute exacerbations that occur with the relapsing-remitting MS. Over time as many as 80% of relapsing-remitting patients transition to secondary progressive MS, which also brings relentless neurodegeneration. There are currently no FDA-approved medications for primary progressive MS, which is the more challenging variant of the disease. And there is only an old standby, mitoxantrone, approved for secondary progressive MS. This skewed MS drug development reflects both the complex nature of the disease and an understanding of its pathology that is still incomplete. The pathogenic pathways of relapsing and progressive MS seem to be quite different. The relapsing form of MS occurs when immune system cells and other factors, which normally protect the body from infections and cancers, go rogue. They manage to leave the bloodstream and cross the blood–brain barrier to attack the protective myelin covering of nerve cells in the brain and spinal cord. In contrast, in progressive disease the flow of these immune cells from the circulation into the brain is less prominent. Instead, there is compartmentalization of T and B cells and aberrant cytokines that activate microglia, T and B cells in the central nervous system. In progressive MS, there’s also more degeneration and loss of neural cells and nerve fibers that cause permanent disability. The treatment of progressive MS is complicated by the fact that the blood–brain barrier, a kind of biological moat that defends the central nervous system from all manner of pathogens, also keeps medications at bay, so they can’t enter the central nervous system. Researchers face the problem of not having a good animal model for the disease. The absence of treatments for primary progressive MS may be about to change with a new monoclonal antibody rushing through FDA approval. In February, the FDA granted breakthrough status to ocrelizumab, which is being developed by Genentech, a member of the Roche Group. In a Phase 3 trial called ORATORIO, ocrelizumab was studied in 732 patients with primary progressive multiple sclerosis. The drug was administered intravenously, as two infusions of 300 mg given two weeks apart every six months. At the end of the study period, ocrelizumab significantly reduced disability progression sustained for at least 12 weeks by 24% compared with placebo as measured by the expanded disability status scale. The scale is based on physical and neurological exams of vision, coordination, limb movement, strength, thinking abilities, bowel and bladder control, sensation, and walking ability. 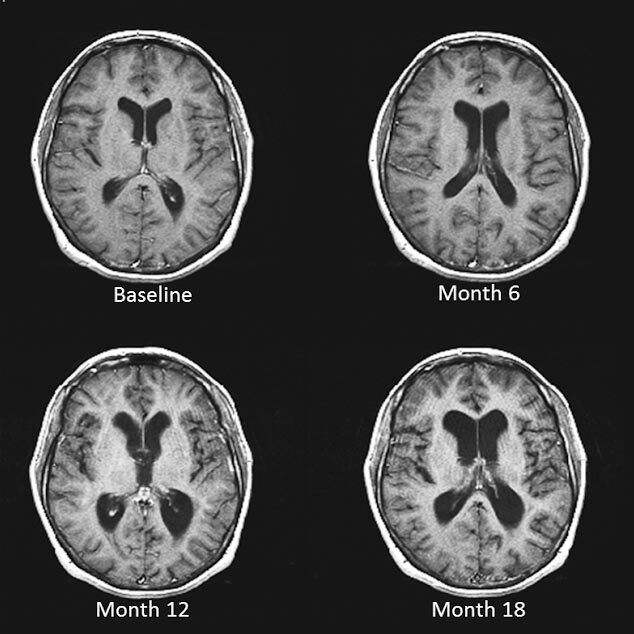 Ocrelizumab has also been tested in two Phase 3 trials for relapsing MS. Those results show that it was superior to interferon beta-1a, reducing the annualized relapse rate by nearly 50% over a two-year treatment period. So ocrelizumab may be effective as a treatment for both forms of MS, and Roche has said it will apply for the dual indications. The breakthrough status, however, applies only to primary progressive MS. Researchers involved in ocrelizumab’s clinical trials say we may now have our foot in the door with primary progressive MS. Suhayl Dhib-Jalbut, MD, says that ocrelizumab has helped researchers cross an important threshold in MS drug development by identifying and targeting a new subset of MS-causing immune cells. Dhib-Jalbut is a professor and chair of the neurology departments at both of the Rutgers medical schools, Robert Wood Johnson Medical School and the New Jersey Medical School, and past president of the Americas Committee for Treatment and Research in Multiple Sclerosis. Relapsing and progressive MS are thought to be caused by T and B cells that attack the central nervous system. The prevailing wisdom is that aberrant versions of these cells and the signaling molecules that they produce breach the blood–brain barrier and attack the protective myelin sheath around nerve fibers as well as the nerve fibers themselves. An MS attack or relapse results in brain cell inflammation that shows up as lesions on MRI scans. There is an alternative theory that an abnormality in the central nervous system itself causes demyelination and neurodegeneration and that inflammation is just a byproduct. For many years the research and drug development focused primarily on T cells, says Dhib-Jalbut. The drugs that work in relapsing MS either kill those T cells or sequester them in the body and prevent them from getting into the brain. Daclizumab, for example, targets CD25, a component of the interleukin-2 receptor on T cells that promotes their growth. “But in the majority of patients we have a growing understanding that MS is mediated by T and B cells; both coordinate the attack on the nervous system,” says Dhib-Jalbut. And some agents do target both types of cells, including natalizumab (Tysabri), alemtuzumab (Lemtrada), and fingolimod (Gilenya). Ocrelizumab is novel and achieved its breakthrough designation because it selectively binds to and depletes CD20-positive B cells. Results from preclinical studies show that while ocrelizumab binds to the CD20 proteins expressed on aberrant B cells, it does not latch onto stem cells or plasma cells, and therefore important functions of the immune system may be preserved. Dhib-Jalbut explains how ocrelizumab’s focus on CD20-positive B cells makes it the potential first in class agent for progressive MS. He says that the meninges, the protective brain covering, is rich in B cells that may contribute to progressive MS by passing through the blood–brain barrier when they’re aberrant. By homing in on CD20-positive B cells, ocrelizumab is able to knock them out and other aberrant B cells circulating in the bloodstream, explains Dhib-Jalbut.